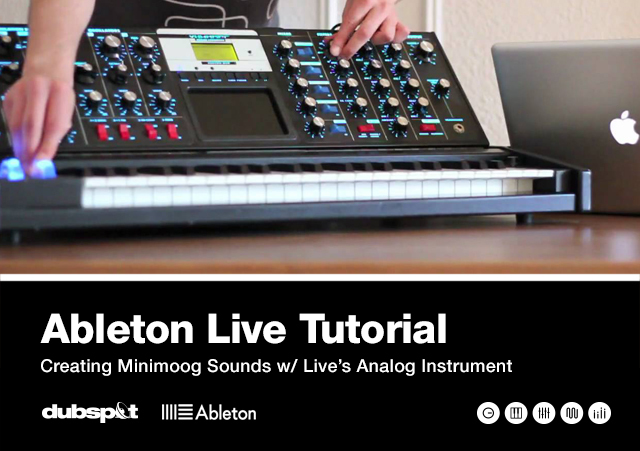 In this Ableton Live Analog tutorial, Dubspot contributor Josh Spoon explains how to get a classic Minimoog sound with Ableton’s Analog synthesizer. Ableton Live Classes start 9/8, 9/22 in NYC, and 9/22 in LA. Enroll Now! In 1970 Bob Moog took popular music by storm with the Minimoog synthesizer - the first fully self-contained portable synthesizer that did not require patch cables for routing. It put synthesizers in the hands of musicians, and set the stage for all synthesizers that would follow. Over 40 years later, it is still sought after by musicians around the world and is heard in countless pop, funk, rock, R&B, dance, house, and techno tracks. You may know the thick bass sound of the Minimoog from artists like Bernie Worrell, of Parliament Funkadelic and Talking Heads fame, who uses a Minimoog on stage to this day. Or you may know it from songs like Zapp and Roger’s “More Bounce to the Ounce.” Or maybe from Bob Marley’s “Stir It Up,” which also used the iconic synth. One of the most prominent uses of this sound was in the sound of disco, specifically with Giorgio Moroder’s famous collaborations with Donna Summer. Learn more about this iconic synth in our Classic Gear article on the Minimoog synthesizer. In this tutorial we will explain how to replicate the lead synth sound from Pink Floyd’s ”Shine on You Crazy Diamond” which was played on a Minimoog synth. The section we are going to focus to replicate is on starts at 06:26, the beginning of part III and ends at 07:33 (see below clip). The Minimoog’s basic elements are 3 oscillators (one that can operate as an LFO), with 6 wave types, a low pass filter, and an amplifier. There are envelope generators for the filter and amplifier. We will be using Ableton’s Analog, a virtual analog synth that contains 2 oscilators, filters, LFOs, and amplifiers and filters. Analog gives us enough features to replicate sounds for this Minimoog patch. We can hear that the patch had a quick and mellow brass tone with some hints of delay and chorus to thicken up the sound. The first thing we’ll want to do is drag out the default Analog synth to a MIDI track. Note: Keep in mind that your default presets may be a little different from mine. I am writing out the changes I am making from the Ableton Live defaults, made from the Live 9 install. Inside Analog we’ll take a look at “Osc1“. We want to get a brass-like sound like in the song and is available on the Minimoog, so we’ll need to give “Osc1” and use a Sawtooth wave. A Sawtooth wave creates a lot of frequencies passed the fundamental or rote note, called overtones, just like brass instruments. We also want a little pitch vibrato from the LFO, which we’ll set up in a bit. Here are the settings for “Osc1“. Now “Osc2″ uses another waveform called a Rectangle wave. If you notice in the “Pulse Width” section, the width is 10%, making a thin nasally rectangle. This type of wave is good for creating woodwind sounds but we are mainly using the is oscillator at a low volume to create light phasing and depth. Both oscillators will be running through Filter 1 since we set the F1/F2 setting to F1. This will allow us to filter out the frequencies of both oscillators in the style of the Minimoog. The settings that we will use for this will help the synth mimic the blow of a horn. Usually, when you play a horn your lips are puckered and you slowly open them for the air to pass through. When changing the shape of your lips and mouth, you are able to change the brightness of the tone. This is the same thing the Minimoog does in “Shine on…”. Using the envelope set to a Linear slope we slowly modulate the Low-Pass frequency filter, when the key is pressed. Though the Frequency is set to 98hz the Envelope setting opens the filter up to about 1.5KHz over the ramp of the attack then decays down slightly and on key release drops back down. With these settings we are using the envelope of the filter to make the horn tone. This along with a little bit of the LFO1 modulation, when set, will make it more life-like, adding character and some of the vibrato we hear in the song. The LFO is where the waveform that will be subtly modulating all of the parameters we have set with LFO. 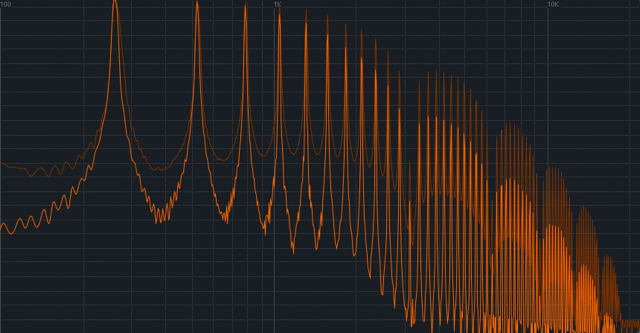 We do this to get more character in the patch by creating vibrato and tremolo variations with the LFO’s triangle wave. This LFO is now modulating the parameters we set in Oscillator 1′s pitch, the Filter Frequency, and the Amp level to help create some motion in the sound of this horn. We’ve already set our vibrato thru the LFO. We will not use Unison because we’ll use Chorus later which is more like what would have been used in the son. Glide is easily done manually by having 2 voices. This gives you the control at your finger tips. Due to the shortness of you the Amp release you can hit the next key and let off the previous key whenever you want to achieve the either runs or quick short bursts of notes. Lastly, we’ll add a little bit of spice. I hear some chorus, delay bouncing back and forth, and a little bit of depth of reverb. Drag in a copy of each of the the three effects. The Reverb is a modified version of “Ballard Reverb” in the Reverb presets of Live 9 (do a quick search in Audio Effects). 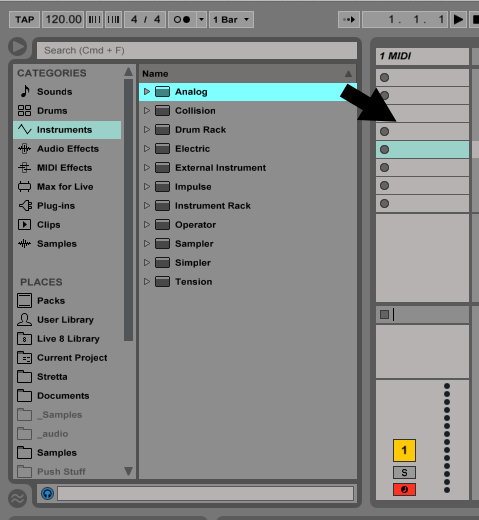 Drag in Ableton Preset “Ballad Reverb” and we’ll make some changes. I did these to taste. Adding in Chorus to thicken the patch, a Ping Pong Delay, and Reverb to add a nice little trail for the notes as you play; you will end up with a pretty convincing Crazy Diamonds synth. It definitely can not sound exactly the same since Analog is not a Minimoog, but it makes a pretty convincing sound. You can use this tutorial to help you explore the parts of Analog and see where this can take you in your own journey into creating your own sounds. Thanks for checking out this Ableton Live Analog Tutorial. Be sure to like us on Facebook and subscribe to our YouTube channel for more tutorials! « Dubspot Student Spotlight August 2014! Housing Corp, Icarus Moth, Jay Dabhi, Maffa Miller, DJ Dan Ho!